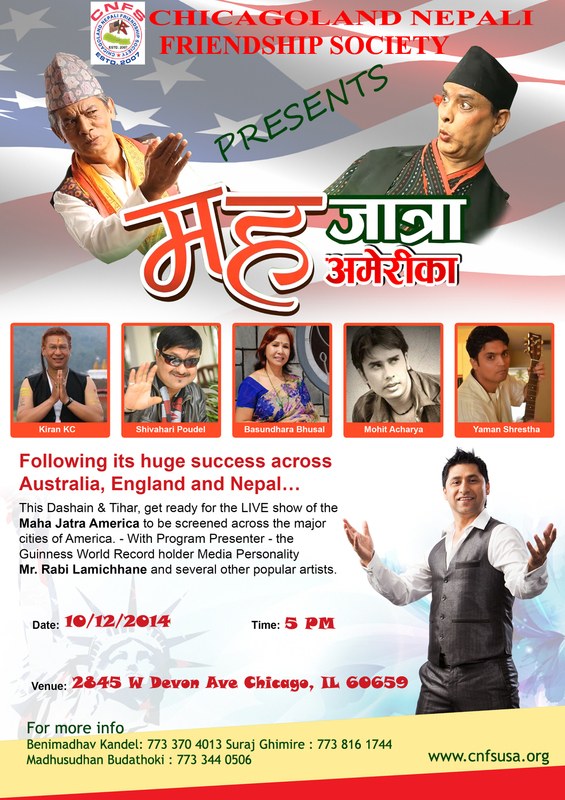 We are very happy to announce Dashain Tihar Saanjh 2071 & Maha Jatra 2014 in Chicago. MAHA Jodi along with Kiran K.C. (Rata Makai), Shiva Hari Poudel, Basundhara Bhusal, Mohit Acharya, Yaman Shrestha including Ravi Lamichhane and other famous artists from Nepal performing in the event. The event will be on 12th October 2014 at Croatian Cultural center, 2845 W Devon Ave. Please mark your calendar for this great celebration together. Please buy your ticket as soon as possible as we have limited seats. Time: 4:30 PM to 9:30 PM, food ticket will be available in Front desk at venue location.